The day before yesterday I posted a new version of pbtree that could simulate first pure-birth & then birth-death phylogenies conditioned on both the total number of tips & the total time via rejection sampling. That is, it simulates trees for total time t and then rejects any phylogeny that doesn't have the correct number of tips, N.
1. Simulate a set of wait-times to total time t. For each wait time, we also need to compute a birth or death event and keep count of the births minus the deaths (m) so that we can draw our exponential waiting times with λ = m × (b + d). Repeat until the number of lineages, m, at t is equal to N.
2. With this set of waiting-times & birth or death events in hand, simulate the tree. By simulating the waiting-times first, followed by the tree, we know before we start that our tree will be of length t with N taxa. This should reduce computation time dramatically. Phylogenetic tree with 365 tips and 364 internal nodes. This isn't without its limits, of course - but we could never do this via rejection sampling. Neat. Interesting. I once did a similar 'cheat' with simulating birth-death trees that had gone stochastically extinct by using rtree and replacing the branch lengths with exponential random variables with rate = b+d. Interesting. I'm not sure this gives the right distribution of waiting times. For instance, consider d->0? As d gets small, towards zero, you expect very few extinctions - but your rtree phylogeny would have many/all going extinct before the end of the simulation, correct? To be clear, this is not what I did here. In this function (with method="direct"), I merely simulated the waiting times & births/deaths first through time t; then evaluated whether or not they satisfied the criterion criterion N. Then I built the structure of the tree using these wait-times & births/deaths in memory. Yes, for the sake of these simulations, it is presumed that a clade that is entirely extinct is desired. This becomes very unlikely as d goes to zero, but that should be obvious to a user. In my case, I tend to simulate b=d, as suggested by estimates from the marine invertebrate record (Stanley, 1977; Sepkoski, 1998). Yeah, I understood what you did was pretty different. Yes, I'm aware of that. I was going to do a post about it comparing it to phytools - but I've been experiencing some problems with TreeSim for sim.bd.taxa.age(...,mrca=TRUE). Either it crashes R or, when I tried TreeSim 1.8 this morning, it works - but then R crashes when phytools is loaded. Not sure what's happening. In theory TreeSim should be much more powerful than phytools. 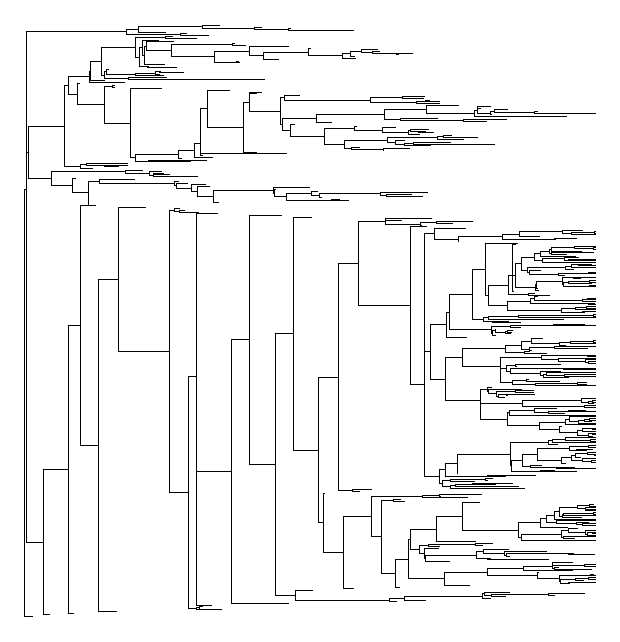 2) pbtree can (optionally) retain extinct & extant lineages, like birthdeath.tree (e.g., here). I cannot find this in TreeSim, but I could be missing it. I've been struggling with this crashing problem in TreeSim as well. As far as I can tell, it's caused by a bug in collapse.singles in ape 3.0-8 which calls reorder on the tree with degree two nodes, leading to a seg fault and an R crash. Removing the reorder line from collapse.singles (or reverting to an older version of ape) stops the crashing. Just a heads up if you haven't already solved this problem. It's also worth noting that TreeSim can return (and does so by default) complete trees when you condition either on t or n, but not both. The algorithm to simulate trees conditional on t and n is efficient, but it's only simulating node heights for the reconstructed process, so cannot return extinct lineages.